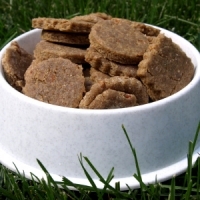 Some snacks for the four legged crowd. Add the egg, peanut butter, maple syrup and water to the bacon fat and mix thoroughly. Add in the flours and wheat germ and mix until combined. Stir in the crispy bacon pieces. Roll out the dough on a lightly floured surface to about 1/4" thick. Cut into desired shapes. I used three different 1" cookie cutters. Bake in the oven for 12-15 minutes (for 1" diameter shapes) until lightly browned. Cool and make them beg for it.